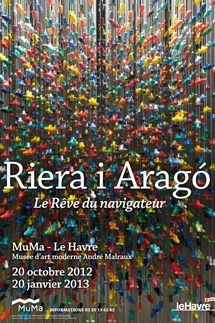 Riera I Aragó belongs to the generation of Catalan sculptors who, in the 1980s, gave a new dimension to the art form. While using traditional materials such as iron, wood and bronze, the artist nevertheless manages to transform the uses of the genre in a uninhibited and personal way. Fascinated by machines, mechanical, aerial and aquatic engines, but also by physics and scientific culture, Riera I Aragó builds an entertaining and poetic world like no other, centred round key figures like the airplane, the zeppelin, the submarine and the fishing boat. The objects are transformed and "poetized" in the form of sculptures and installation art. The machine loses some of its common sense, reoriented with tenderness and irony. While it is a sign of the sculptor's interest in his era, it becomes the point of departure for an invitation to journey between the real and the imaginary.